BACKGROUND: Some evidence suggests that childhood croup could be associated with increased incidence of adulthood bronchial reactivity, but its significance is uncertain. The aim of the present study was to evaluate the long-term outcome of early life croup. PATIENTS AND METHODS: This case–control study was conducted in 2010–2012 in Isfahan, Iran. The case group consisted of 164 adolescents with a history of severe croup in early life and an equal number of healthy controls without any history of croup or other chronic or recurrent respiratory diseases. The two groups were compared according to pulmonary function tests and bronchial reactivity (exercise challenge test). Statistical analyses were performed using the SPSS software package, version 20 (SPSS Inc., Chicago, IL, USA). P < 0.05 was considered significant. RESULTS: Baseline spirometric values (forced expiratory volume in 1st s (FEV1), forced volume capacity (FVC), FEV1/FVC, and forced expiratory flow at 25%–75% (FEF25–75) were similar in case and control groups. A reduction in FEV1 and FEF25–75 after exercise challenge test was seen in 9% and 12.8% of patients, respectively, whereas this was reduced in only 4.2% and 6.1% of the controls (P = 0.034 and P = 0.021, respectively). CONCLUSION: Our findings suggest that childhood croup might be a predisposing factor for bronchial hyperreactivity in adulthood. Longitudinal studies are necessary to confirm the clinical significance of these findings. Several studies have confirmed the direct relationship between lower respiratory tract infections and the incidence of asthma.,, However, the relationship between upper respiratory tract infections, such as croup and asthma, is controversial., It is demonstrated that childhood croup may increase the incidence of asthma at the age of 10. However, this relationship was not confirmed by other studies. On the other hand, any association between croup in early life and pulmonary function test abnormalities in adolescence is confusing. Children who experienced croup had had a lower mean percentage predicted forced expiratory flow (FEF) at both 50% and 75% of forced vital capacity than those who had not. No clinical study has evaluated the effect of the duration and severity of croup on asthma development. Therefore, this study was designed to evaluate the relationship between croup and asthma development. This case–control study was performed in Al Zahra Hospital, the main referral hospital affiliated to Isfahan University of Medical Sciences, Iran, in 2010–2012. Inclusion criteria included age <4 years old at admission time, Westley croup score of at least 6, access to patients, and their complete records. 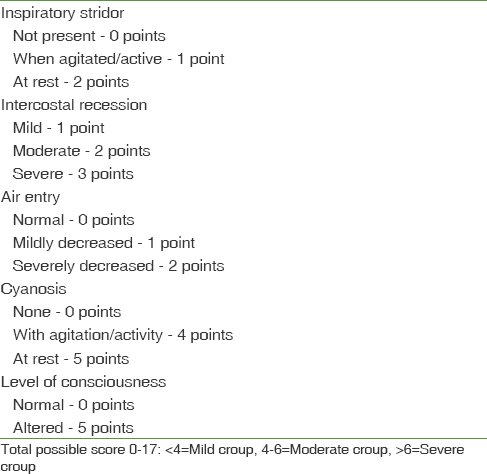 Westley croup score was the sum of points allotted for each of the following: inspiratory stridor, intercostal recession, air entry, cyanosis, and level of consciousness [Table 1]. The exclusion criteria consisted of previous history of bronchiolitis, active or passive smoker, and inability to perform spirometry. One hundred and sixty-four patients with a history of severe croup who had been admitted in the hospital between 1998 and 2001 were recalled and reevaluated by spirometry and exercise challenge test. Patients' information was collected from the archived files of the hospital. The control group was selected from the middle school adolescents by easy sampling method. They had no history of hospitalization due to respiratory problems and were matched with the case group. The study was approved by the Ethics Committee of Isfahan University of Medical Sciences (ID number: 4531). Before starting the study, written informed consent was obtained from the patients' parents or legal guardians. Spirometry was performed before and after 10 min of exercise in both groups. Forced expiratory volume in 1st s (FEV1), forced volume capacity (FVC), FEV1/FVC, and FEF at 25%–75% (FEF25–75) were calculated. According to the American Thoracic Society criteria, a reduction of more than 12% in FEV1 was considered as bronchial hyperreactivity. The Kolmogorov–Smirnov test was used to evaluate the distribution of quantitative variables. Values were expressed as frequency (number and percentage) and mean ± standard deviation. Fisher's exact test and Chi-square tests were used for 2 × 2 comparison of categorical variables, whereas t-tests were used to compare numerical variables. Pearson's and Spearman correlation coefficients were calculated for assessment of correlation between quantitative and qualitative variables, respectively. Statistical analyses were performed using the SPSS software package, version 20 (SPSS Inc., Chicago, IL, USA). P < 0.05 was considered significant. During 1998–2001, 220 patients with severe croup were admitted in the emergency department of Al-Zahra Hospital in Isfahan, Iran. Forty children did not meet the inclusion criteria (28 were reevaluated as mild or moderate croup [Westley croup score <6], 7 were not available, and 5 had incomplete records). Sixteen children were excluded from the study (10 children were passive smokers and 6 were unable to perform spirometry). Finally, 164 patients were enrolled in the study. The mean age of the case group and the control group was 13.7 ± 2.2 and 13.1 ± 1.8 years, respectively. There was no difference in terms of age between the two groups (P = 0.82). The mean age of the patients with a history of croup at the time of diagnosis was 2.9 ± 1.3 years [Table 2]. In the case group, the prevalence of croup in boys was higher than in girls (92 vs. 72, respectively) (P = 0.020). Baseline spirometric values (FEV1, FEV1/FVC, and FEF25–75) were similar between the two groups. Nine percent of the cases and 4.2% of the controls had a significant reduction in FEV1 (P = 0.034), and 12.8% of the cases and 6.1% of the controls had a significant reduction in FEF25–75 after exercise challenge test (P = 0.021). In this study, we determined the relationship of childhood croup (those which lead to hospitalization) with further bronchial hyperreactivity in adolescence. In our study, the incidence of croup was higher in boys. It was in agreement with other studies by Nafstad et al. in 2005 and Balemans et al. in 2006., Other studies suggest that recurrent croup is a risk factor for asthma., In a study by Castro-Rodriguez et al. in 2001, it is proposed that children who present with croup may or may not be at increased risk of subsequent recurrent lower airway obstruction, depending on the initial lower airway involvement, and preillness and postillness abnormalities in lung function associated with this condition. They concluded that if croup is associated with wheezing and lower airway involvement, the risk of asthma would be increased. In a study by Nicolai and Mutius, asthma was diagnosed in 37.3% of children with croup and a positive family history. In our study, the prevalence of asthma in the case group was 21.8%. However, in another study by Van Bever et al., the prevalence of asthma in children with croup was 7%. In our study, there was a significant correlation between the history of severe croup and the prevalence of asthma (P = 0.01). Moreover, we found a correlation between the croup in early childhood leading to hospitalization and a reduced FEV1 after exercise. However, this relationship was not reported in the study by Balemans et al. in 2004. FEF25–75 is indicated as small airway obstruction and is not dependent on the cooperation of the patient in performing spirometry. A reduction of more than 12% of FEF25–75 in children is a sensitive criterion for the diagnosis of asthma. Accordingly, in our study, this relationship (between croup in early childhood and reduced FEF 25–75) was significant. This relationship was also shown in a study by Balemans et al. in 2004. The explanation for these findings was the older age and better cooperation of the participants when performing the spirometry. However, Van Bever et al. reported no difference in the mean percentage predicted FEV1, FVC, and PEF between children with and without croup or recurrent croup. However, they reported a lower mean percentage predicted FEF50 and FEF75 in children who had suffered from croup in comparison to those had not. Therefore, croup and recurrent croup are associated with bronchial asthma. The association seems essentially based on the presence of hyperreactive airways and to a lesser extent, on the presence of atopy, although the latter can be considered as an aggravating factor. The reduced FEF50 and FEF75 found in children with croup proposed small airway involvement. It appears that inflammation related to upper and lower respiratory tract infections in the early years of life may cause a series of inflammatory processes in the air ducts (especially the small airways). It may lead to impaired immune breathing systems. Therefore, the patients will be at risk for chronic diseases (such as asthma) in the later years of life. Further studies are needed for establishing the relationship between upper respiratory tract infections and asthma. It seems that preventing the respiratory illnesses (including croup in early childhood) can reduce an individual's risk of asthma in the future. Regardless of the relationship between croup and asthma, our study showed that FEF changes with respect to FEV1 could be considered as a more precise criterion for the diagnosis of asthma in children. One of the advantages of our study is the review of older people and their better cooperation with spirometry. Inflammatory diseases of the upper respiratory tract (e.g., croup) and lower respiratory tract (e.g., bronchiolitis and pneumonia) in early childhood could increase the risk of asthma in adolescence. It could be either as changes in clinical or spirometric indexes, particularly FEF25–75. Our findings suggest that childhood croup might be a predisposing factor for bronchial hyperreactivity later in life. Longitudinal studies are needed to confirm the clinical significance of these findings. We wish to thank all the patients, family members, and staff from all the units that participated in the study. Cherry JD. Clinical practice. Croup. N Engl J Med 2008;358:384-91. Kwong K, Hoa M, Coticchia JM. Recurrent croup presentation, diagnosis, and management. Am J Otolaryngol 2007;28:401-7. Moussa MA, Skaik MB, Yaghy OY, Salwanes SB, Bin-Othman SA. Factors associated with asthma in school children. Eur J Epidemiol 1996;12:583-8. Mazza D, Wilkinson F, Turner T, Harris C, Health for Kids Guideline Development Group. Evidence based guideline for the management of croup. Aust Fam Physician 2008;37:14-20. Arshad SH, Kurukulaaratchy RJ, Fenn M, Matthews S. Early life risk factors for current wheeze, asthma, and bronchial hyper responsiveness at 10 years of age. Chest 2005;127:502-8. Kivity S, Agmon-Levin N, Blank M, Shoenfeld Y. Infections and autoimmunity-friends or foes? Trends Immunol 2009;30:409-14. Nafstad P, Magnus P, Jaakkola JJK. Early respiratory infections and childhood asthma. Pediatrics 2000;106:E38. Björkstén B. The hygiene hypothesis: Do we still believe in it? Nestle Nutr Workshop Ser Pediatr Program 2009;64:11-8. Segal AO, Crighton EJ, Moineddin R, Mamdani M, Upshur RE. Croup hospitalizations in Ontario: A 14-year time-series analysis. Pediatrics 2005;116:51-5. Illi S, von Mutius E, Lau S, Bergmann R, Niggemann B, Sommerfeld C, et al. Early childhood infectious diseases and the development of asthma up to school age: A birth cohort study. BMJ 2001;322:390-5. Nafstad P, Brunekreef B, Skrondal A, Nystad W. Early respiratory infections, asthma, and allergy: 10-year follow-up of the Oslo birth cohort. Pediatrics 2005;116:e255-62. Balemans WA, Rovers MM, Cornelis K. Childhood upper respiratory tract infections are not associated with asthma, hay fever and eczema at adulthood: A birth cohort study. Eur Respir J 2004;24 Suppl 48:40. Mulholland A, Ainsworth A, Pillarisetti N. Tools in Asthma evaluation and management: When and how to use them? Indian J Pediatr 2017. [Epub ahead of print]. Akinbami LJ, Moorman JE, Bailey C, Zahran HS, King M, Johnson CA, et al. Trends in asthma prevalence, health care use, and mortality in the united states, 2001-2010. NCHS Data Brief 2012;94:1-8. Hassanzadeh J, Mohammadbeigi A, Mousavizadeh A, Akbari M. Asthma prevalence in Iranian guidance school children, a descriptive meta-analysis. J Res Med Sci 2012;17:293-7. Castro-Rodriguez JA, Holberg CJ, Morgan WJ, Wright AL, Halonen M, Taussig LM, et al. Relation of two different subtypes of croup before age three to wheezing, atopy, and pulmonary function during childhood: A prospective study. Pediatr Am J Rhinol 2006;20:53-63. Lin SC, Lin HW, Chiang BL. Association of croup with asthma in children: A cohort study. Medicine (Baltimore) 2017;96:e7667. Nicolai T, Mutius EV. Risk of asthma in children with a history of croup. Acta Paediatr 1996;85:1295-9. Van Bever HP, Wieringa MH, Weyler JJ, Nelen VJ, Fortuin M, Vermeire PA, et al. Croup and recurrent croup: Their association with asthma and allergy. An epidemiological study on 5-8-year-old children. Eur J Pediatr 1999;158:253-7. Sposato B. Predicted values for spirometry may underestimate long-standing asthma severity. Open Respir Med J 2016;10:70-8.